He will always be remembered by Red Sox Nation as the guy who was traded to bring Jason Varitek and Derek Lowe to Boston. It was the deal that eventually broke the curse of the Bambino and hung a championship banner again in Fenway after over an eighty year drought. It was Dan Duquette’s finest hour, even though the former Red Sox GM was actually trying to get a prospect named Ken Cloude from the Mariners and only “settled” for Varitek and Lowe after Seattle refused to give up on their young power pitcher. 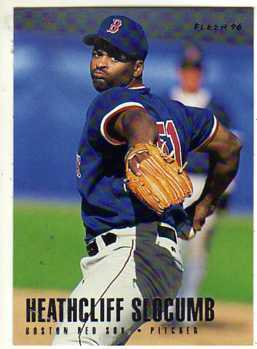 Heathcliff Slocumb’s record was 0-5 at the time of the trade and his ERA was in the high five’s but he was actually in a very nice groove for Boston, having successfully converted 11 of his last 12 save opportunities. That hot streak and an impressive appearance against the Mariners just before the deal went down were the only reasons the Seattle brain trust, who were desperate for a closer, made the trade for the right-handed native of Jamaica, NY at the 1997 trading deadline. As we all know now, Slocumb’s career propelled downward from that point, but not before he registered 10 saves during the second half of that ’97 season to help the Mariners reach the postseason. Slocumb had come to Boston in a trade with the Phillies in a 1996 preseason deal. He was coming off a breakout 32-save season with Philadelphia just one year after his 27-year-old high school sweetheart wife had died from cancer, leaving him with two young daughters. The pitcher used his grief and parental responsibility as a motivator and became one of the more effective closers in baseball. When he saved 31 more games during his first season in Boston, it did look as if he was on the cusp of a great career. Than a horrible start to the ’96 season combined with Seattle’s refusal to part with a pitcher who never made it, changed the course of baseball history for fans in Boston and maybe those in Seattle too.